I sighed with relief last week when the Los Angeles Unified School District negotiated a successful end to the teachers' strike that lasted six school days. The spotlight largely focused on the key players of our school system: teachers, the district, students, parents and higher-level staff. But as a special education assistant for an LAUSD elementary school in South L.A., I work with a segment of our public schools that doesn't get the attention or support it deserves - especially during a strike. My job is to help students with disabilities, even in highly under-resourced schools, reach their full potential. As teachers in Denver and Oakland prepare to stand on the picket line, they should consider the experiences of their special needs students during this time of upheaval. My daughter's teacher is on strike. As a mom, I stand on the picket line with her. 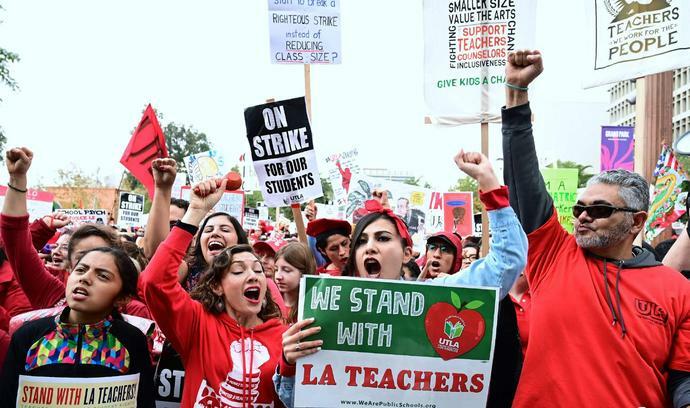 In the L.A. district, 30,000 teachers went on strike and the number of absences at LAUSD schools skyrocketed. Just a third of the district's 600,000 students showed up to school on the strike's first day. Many students and families were forced to find all sorts of creative ways to facilitate learning, such as taking advantage of free entry to museums and zoos, teaching classes at home, or rallying with teachers. However, for low-income students and students with disabilities at high-need schools, many of those options were not feasible. This means that noncredentialed school staff such as myself - along with sanitation workers, office personnel, and yard and recreational support - worked tirelessly to keep schools running for students in attendance. Although many are now celebrating the historic win for teachers, the strike did not come without drawbacks for high-need students whose day-to-day experiences became complicated, and for many, dire. Whereas many LAUSD schools' primary concerns during the strike focused on boring movie days or limited access to clubs and activities, schools with fewer resources in higher-need areas, such as the one I work in, reflected an ugly, age-old truth of how our educational system defaults to treating students of color, particularly black boys, with disabilities. On the first day of the strike, Jan. 14, droves of fourth-, fifth- and sixth-graders noisily filled our school's auditorium for programming. This was standard protocol at many schools, but it was nearly impossible for our administrato to redirect the children's attention to schoolwork amidst the mass confusion that both students and staff were experiencing. One student I work with closely, a boisterous and excitable 11-year-old black boy whose attention deficit hyperactivity disorder, known as ADHD, often has him in the wrong places at the worst of times, paced up and down the auditorium floor. He was greeting friends and dancing in the middle to pass time waiting to be assigned work. It was not long until a school administrator snapped at him with such ferocity that it drew attention. She told him he can no longer be in the auditorium. Stunned, the student (along with some nervous staff like myself) waited for clarification. Where would he go? All classrooms serving this age group at our school remained locked during the strike. The school administrator stated that he could keep himself occupied by walking around the school. It was clear to me that the administrator, overwhelmed and with little support, made an exceptionally bad call. It was raining outside. The student's entire grade level was inside the auditorium with the only available credentialed staff. But what some might excuse as a temporary lapse in judgment was unfortunately all too common during the strike for students like him. Students of color, particularly boys in special ed, were poorly treated. I saw children sent home for arbitrary and vague reasons. They were assigned mandatory escorts to the bathroom and class. At one point, policemen were called in to deal with a classroom infraction for a kindergarten student that left a young black boy screaming and crying in our school halls. During the strike, the resources to deal with high-need students were more scarce than usual, and many students were left in the hands of schools that unconsciously pathologize disability and nonwhiteness because they do not understand it. Unfortunately, many of the students' key advocates, including their teachers who know them and are more skilled in supporting them and meeting their needs, were on the picket lines. It is no secret that children of color have a starkly different experience than their white counterparts in school, especially when it comes to discipline. Black boys, who are three times more likely to be suspended than white boys, face the highest rates of school discipline compared to other groups. Black girls are six times more likely to be suspended as white girls. And black students with disabilities are almost three times more likely to experience out-of-school suspension or expulsion than white students with disabilities, regardless of age. The school-to-prison pipeline starts right here in these kinds of environments when it seems as if no one is paying attention. Although most administrators are well-meaning, a general lack of understanding about the biased ways schools see children of color and students with disabilities created a hostile space for children who are already routinely disciplined. I noticed that students in our school who were already labeled as "defiant" or "bad" were now being chastised for simply showing up during the strike, or appearing to cause trouble. I am proud to have witnessed a landmark moment in L.A. public education. I am even prouder that it was the work of teachers that made it happen. However, what I cannot be proud of is the way many of our schools, the institutions we have fought so bravely to reform, resort to punishing and policing our students, particularly disabled children of color, rather than protecting them. Teachers, the next time you must take to the picket lines - however necessary it might be - remember the most vulnerable children you are leaving behind in schools that are unprepared to support them. We must resolve that no matter the set of circumstances or difficulties our schools face during tumultuous times, we can do better than this. Just like our teachers, our students - all of them - deserve better. David Curtiss is a South Los Angeles native working as a special education assistant for The Los Angeles Unified School District.